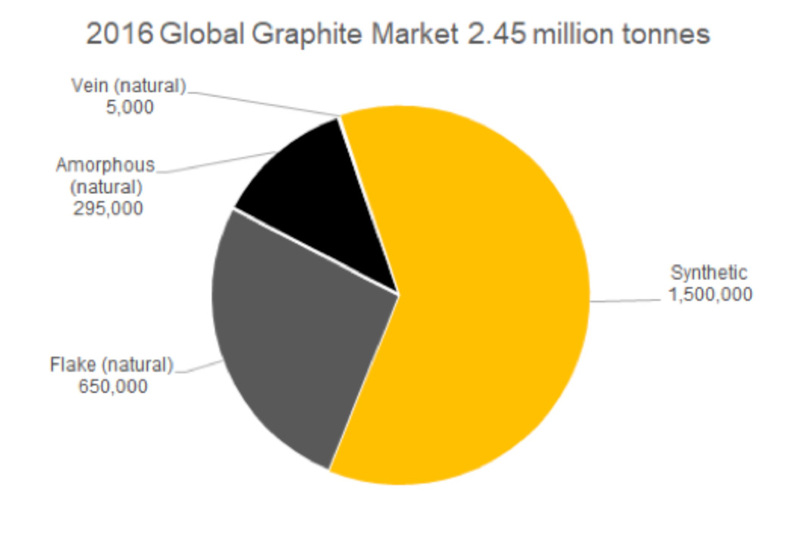 The global graphite market was approximately 2.45 million tonnes in 2016 and is made up natural and synthetic graphite of 950,000 tonnes and 1.45 million tonnes respectively. Although sharing a common name, not all graphite is equal and the end use determines what type of graphite is required. 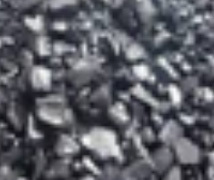 Cost of production is also a significant driver of user demand with a tonne of synthetic graphite costing over twice the amount to produce compared to all the forms of natural graphite given the raw material is baked for over a month at high temperatures to remove the impurities. Flake graphite has a crystalline structure and is produced in the graphitic carbon range of 80% - 98%. As the name implies flake graphite has a distinctly flaky morphology. Amorphous graphite does not have a crystalline structure and is produced in the graphitic carbon range of 70% to 75%. 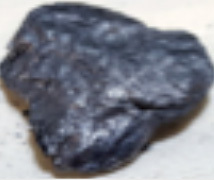 Amorphous graphite is a seam mineral and is typically higher in ash than other forms of natural graphite. The rarest and most valuable form (on a cost per tonne basis) is vein graphite. 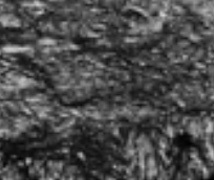 Lump or vein graphite is predominately produced in limited tonnages but at a very high grade (over 98% graphitic carbon). (2) Technical: Electrodes for steel and aluminium production, expandable, brakes, flame retardants. Spherical graphite is a physically and chemically enhanced form of fines ./ -100 mesh flake graphite. The flake graphite is processed by turning flakes of natural graphite into spherical shapes usually measuring between 10 to 40 micron and purifying it, usually to 99.95% or above. This process increases the surface area and conductivity making it ideal for use as the anode material for battery technologies. Expandable graphite is a graphite product which takes natural flake graphite as raw material and is treated by a chemical or electro-chemical process. When heated under high temperature it expands 150-400 times in volume instantaneously. It is a high-quality material for making flexible graphite sheets and various sealing components. It can also be used for heat preservation in metallurgical industry and as fire-extinguishing agent for fire fighting. Most of us carry lithium-ion batteries with us everywhere we go. But while these batteries are renown for enabling proliferation of portable electronics, smart phones and electric vehicles, their working principle and primary ingredients are less understood. Lithium-ion batteries store energy electrochemically; an ion is electrically charged through gaining or losing an electron. The energy is stored as watt hours (Wh), which is determined by multiplying amp hours (Ah) by voltage (V). This is commonly visualised with water mass analogous to energy in a river or tap scenario, whereby amp hours is the flow rate (Amp = current) and duration, and voltage is the volume or width/depth of the river. 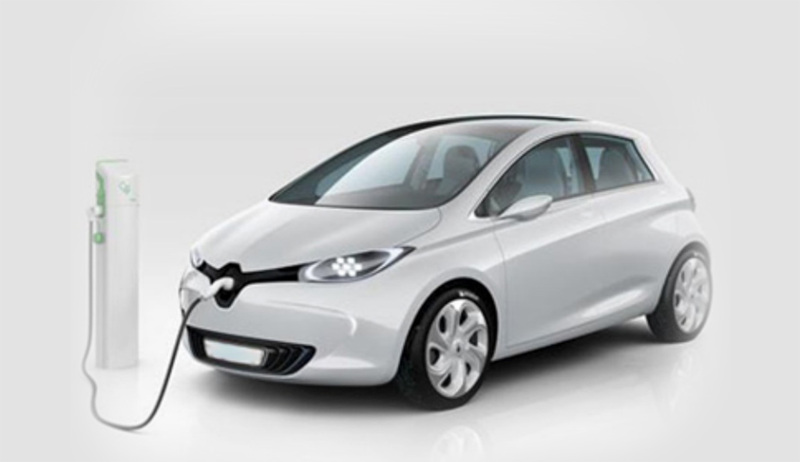 There are two types of lithium-ion batteries; primary (which means non-rechargeable) and secondary (rechargeable). Secondary lithium-ion batteries are comprised of a positive electrode (cathode – usually transition metal oxides), negative electrode (anode – usually graphite), separator (usually polypropylene) and electrolyte (usually LiPF6 with an organic or inorganic solvent). The electrical potential difference between positive and negative electrodes determines the battery voltage (V). The energy density of the material, and how much of it is used determines the amp hours (Ah). Electrolyte contains lithium salt and chemicals which provide a medium for shuttling lithium ions with low ionic resistance. The separator is a safety feature which ensures the positive and negative electrodes don’t come into physical contact with one another. When a battery is charged (device =100%), lithium-ions fill space in the negative electrode host material, this host is almost always graphite based. When the battery is in use, electrons from the negative electrode travel through a device to the cathode, where the lithium-ion shuttles from the negative electrode through the electrolyte and separator to the cathode, creating a circuit. When charging (device=10%) the opposite occurs, lithium ions travel to the anode and electrons through the device in the opposite direction. The system only performs well when in balance, and balance is based on the electrochemical properties of all inputs. Within commonly used lithium-ion battery chemistries, almost all contain more carbon (graphite) than any other element. 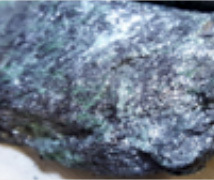 On a mass basis, the anode material (graphite) content required is approximately half that of the cathode material, this is because cathode material has a much lower energy density. 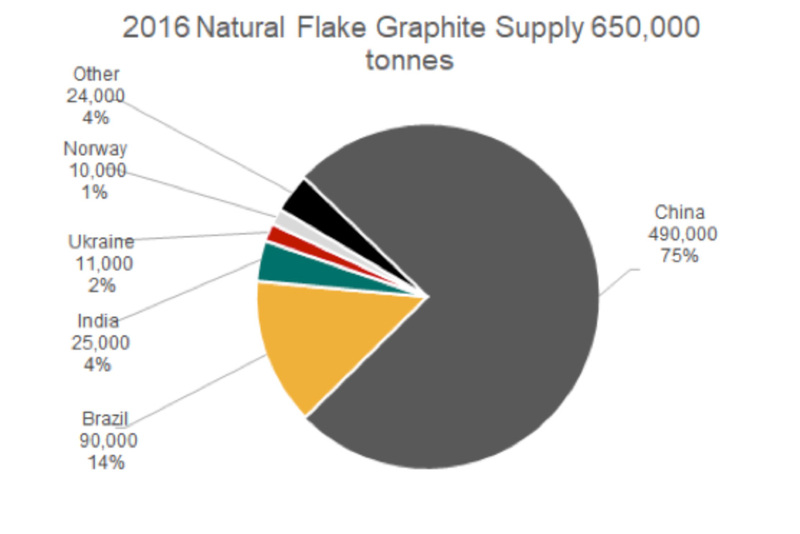 Today, roughly 50% of the carbon-based (>90%) anode material globally is natural graphite based, processed from crystalline flake graphite with a typical yield ranging from 35-50% depending on the product. The balance comprises synthetic graphite materials which are produced using carbon-rich materials, such as coal and petroleum based precursors, held at extremely ultra-high graphitisation temperatures (2400-3100°C) for long holding and cooling periods. 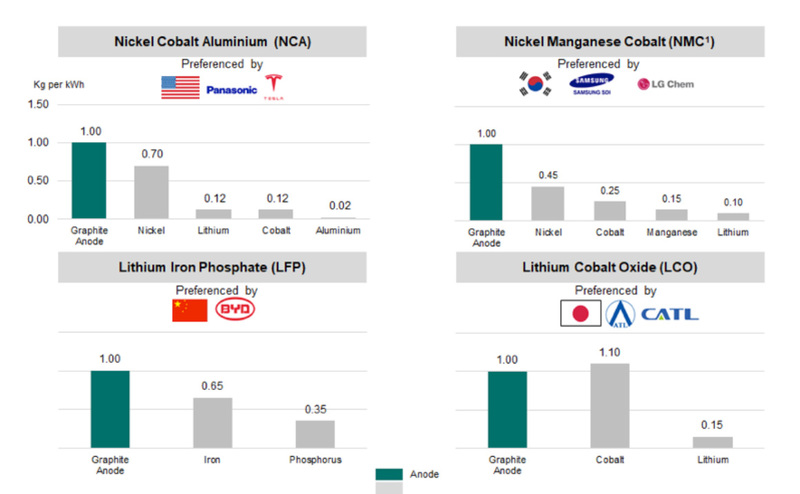 Graphite has so many characteristics which underpinning its leadership position as the anode material of choice for commercial lithium-ion rechargeable batteries. Mostly importantly, graphite is inert, stable and safe - and we carry a lot more of it than we think.